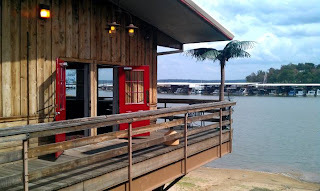 On our drive through Oklahoma we stopped at a redneck yacht club in Yogi Bear's Jellystone Park Resort and had lunch on their back patio. Anyone know who's from this town? Just the 1 and only Carrie Underwood! I think this is the 2nd time we've driven through her hometown, but the 1st time getting a picture. She's from the sticks people. The sticks. 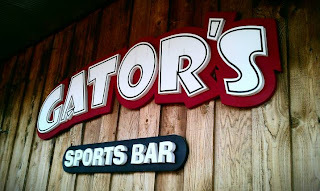 And I bet she's eaten at Gator's. I mean, it's only about 5 miles from Checotah. the only reason i knew the answer is because of that song that was on her first album..."i aint in checotah anymore." i mean...i was raised in a town called Due West. not one stop light or grocery store. we only recently got a Dollar General and a subway. yesss! Love Carrie and that she's from the sticks! I knew the answer to that! Yah, love Carrie! well of course she is from the sticks...most of us cool gals are. haha! I love Carrie Underwood! I saw your pictures, and I'm like "OH! CARRIES FROM THERE!" then I kept reading and saw your wrote that! Haha. That looks pretty awesome though, with the sports bar right on the lake!! I'd love to be there, or anywhere like that, right now!